Morocco Mars 2013 expedition – ABM Space Sp. z o.o. ABM SE team is packing up for the departure to Morocco. Magma White rover is already there. We are taking electronic equipment to be integrated with the rover in the desert. As usual TME, Archimedes and EPAR, our technological partners, support the mission. There is L.I.F.E. detector already mounted onboard the robot. The device has been built by an Austrian-American team of biologists and engineers. It will be used for search of traces of life in the hostile terrain resembling the surface of Mars. It is the first usage test of the equipment that can be used in a real Mars mission in the future. We are currently analyzing the satellite images of the area, to find the best “landing spot” for the rover in terms of scientific value and accessibility. We base only on remote sensing – just like in a real space mission. Magma White rover is unpacked in the desert camp. The ABM SE team is on the way to Casablanca. In a few hours we are beginning our car journey through the Atlas mountains, to our “landing site”. ABM SE team has safely arrived at the landing site. 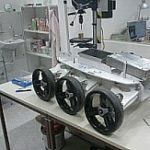 Currently, the team is working on adapting Magma White rover to “Martian” conditions. Magma White came to place without any damage. Yesterday we run our robot for the first time and performed experimental drives. Furthermore, we mounted new electronic devices. Also L.I.F.E. detector is already onboard. In a few hours we launch first daily drives with the Aouda suit. We have one tent in the camp at our disposal. The drives are being performed around the camp area in the test mode. The mission – the landing – officially starts on the 11th of Feb. Yesterday first field tests, in a trial mode, took place. It was not a mission simulation yet, just a test of field communication configuration and capability of roving the local terrain. The driving system performed very well. Today we established remote connection between the rover and HQ in Poland. 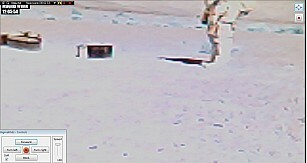 The rover transmits video and receives commands both form the Sahara camp and ABM SE control room in Poland. Saying good bye to Morocco and our rover, remaining at the camp, under the care of the Austrian “crew”. The simulation launches on 11th of February. 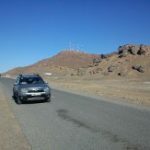 Till that time, however, this is not the rover, that is travelling to its landing site, but us, going to Innsbruck, crossing the Atlas and boarding the plane in Casablanca. Farewell Africa – from now on we will only explore you remotely, with the cameras of our rover. Saturday was a day-off for experiments but the Moroccan Minister of Science and Higher Education visited the desert Base Camp. We have performed a presentation of rover’s operation, controlled from Innsbruck, where we are currently based. The delegation was impressed. Everyone stressed the great importance and potential for further joint projects, involving the Moroccan authorities and universities, and international science and technology teams testing their equipment. A Moroccan-Austrian-Polish scientific cooperation seems very promising for analogue space research. The Mars2013 has the official approval of the King of Morocco. The Expedition is under the official and very helpful protection of the Moroccan Royal Gandarmery. Magma White and the Hungarian PULI rover have performed joined presentation for the minister. 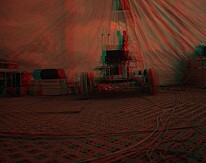 PULI has taken the 3D image of our rover (effect visible after the use of 3D glasses). 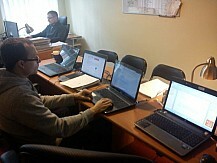 Sunday was the last day of preparations for launching of the simulation. We are working at Mission Support Center in Innsbruck, together with a staff of about 50 people from Austrian Space Forum. 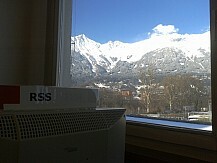 We occupy a whole floor of an office building, windows looking at snow-covered Alps. The mission has officially started! At 10 AM first EVA (extravehicular activity) commenced. The astronauts have performed a series of planned experiments on the surface of „Mars”. In the meantime Magma White rover operated in the vicinity of the base. We were testing mainly operation of the rover in a 10-min signal delay mode. However, the highlight for today was a three-party conversation, between the Mission Support Center in Innsbruck, simulation base in Morocco and… the International Space Station! The experiment scheduled for the afternoon launched as planned. 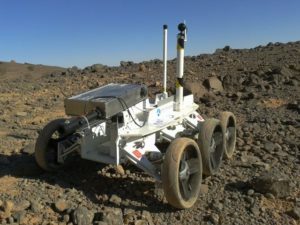 Unfortunately the rover did not respond – due to unknown reasons a complete loss of communication with the main system of the machine occurred. We were performing remote diagnostics during the whole evening and attempted repairs with the participation of the field crew. Part of these activities was performed in Sim mode, with 10-minute signal delay. We had the “Houston we have a problem” situation and despite a negative outcome it turned out to be very interesting and exciting experience. We decided to resume the attempt on the next morning. We have brought up some hypotheses. We have anxiously waited for starting on the robot in the morning and another repair attempt. To our surprise the robot responded immediately. All systems functional. We are happy, but we will all have a lot of work with the analysis of the problem. This situation makes the simulation very… realistic. Both us and the Mission Support Center stated that this was a great exercise for copying with emergency situation. We hope the field crew believes this also, although they are quite tired. We are starting a test drive. Afterwards we are heading back to Toruń. Further operations will be conducted from our HQ. The whole ABM SE team is already in Poland. After working at MSC in Innsbruck we have moved the control to Toruń. Between 23rd and 26th Feb we will conduct further remote operations from our headquarters. We have planned new L.I.F.E. experiments, joint operation with the Hungarian PULI rover and a test of joint operation with the Austrian spacesuit. On 15th Feb we have successfully presented our mission to the ESA delegation present at a Workshop in Warsaw. The image from rover’s camera and commands were transmitted from Sahara, with support of the MSC in Innsbruck, to Toruń and Warsaw. We have connected 4 geographical locations, Sahara crew, Innsbruck personnel, 2 ABM teams and the audience – the ESA delegation. The mission is getting to an end. Before it ends, we have the whole weekend or remote operations, performed from Toruń. 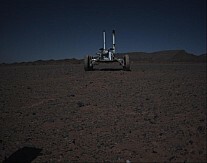 From the very dawn the robot is performing joint tasks with the Hungarian PULI rover. Whole session aims at diagnostics of problems both machines have encountered during the whole mission. We are diagnosing them by comparison of operation of both rovers, in similar conditions and at the same time. Eventually both rovers headed to the desert at 13 CET. The weather conditions were very bad – strong wind blowing large amounts of fine dust. We were afraid that dust penetration can physically harm the electronics or the optics, but no such problems occurred during the 2-hours run. The dust did not impair our vision either. We have practiced joint run at a safe distance and communication procedures between three teams. Cooperation with Puli Mission Control was very friendly and efficient. Both rovers have photographed each other from all sides. Thank you Puli and MSC! Monday’s tests were sponsored by “Delta” letter. Delta Experiment is a series of comparative tests, with astronaut performing simple tasks with a suit donned, and later the same tasks without the suit. It aims at defining limitations and obstacles that the future human crew might encounter on Mars. While designing the new generation of rovers – the astronaut support robots, we have to perform functional and usability tests of our devices directly interacting with astronauts. While monitoring a human in a suit performing experiments we were able to define new set of directions for development of support and human-robot interaction for our new designs. The last day of the simulation. The mission has been accomplished. We have completed all assumed goals, with only small problems that brought us new experience and some spice. All of that was possible with the great cooperation with the Austrian and other teams. We were at the Sahara-Mars together. Today we are performing the last field run. The last traverse, that we outline on the satellite map, ambitiously aiming at a narrow throat of quite difficult terrain. We will publish our route here soon.